Fulfilling the promise of his vast potential, Taiwan’s Pin Yi Ko wins the World 9-Ball Championship, dashing Shane Van Boening’s hopes of bringing the title back to the U.S. There is little argument that the World Pool-Billiard Association (WPA) World 9-Ball Championship is the toughest tournament in the world to win. 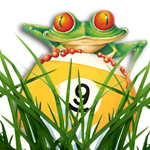 Unlike the sporadically staged WPA World 10-Ball and World 8-Ball championships, the World 9-Ball Championship has been staged every year since 1990, with the exception of 2008 and 2009, when the event failed to secure sponsorship. Among the game’s elite, it is the title revered above all others, and every nation’s champion players fight for the opportunity to wedge themselves into the talent-laden 128-player field. And as if the sheer depth of talent isn’t enough, the fickle and unpredictable game of 9-ball itself makes the task of advancing through the treacherous group stage gauntlet and winning six single-elimination matches even more daunting. One only need look at the unlikely finalists in recent years to realize the degree of difficulty the annual WPA championship provides. For every Darren Appleton, Niels Feijen and Thorsten Hohmann that have reached the title match, the 9-ball world championship has seen its share of Albin Ouschans, Yukio Akagariyamas and Ronnie Alcanos — all world-class players, but hardly perennial international champions. No, the WPA World 9-Ball Championship is not often kind to predetermined favorites. 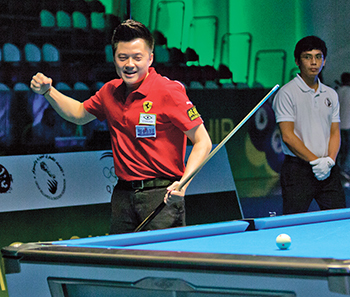 In 2015, however, the World 9-Ball Championship delivered perhaps the perfect title match — heavyweights from opposite ends of the globe, each seemingly predestined to win the coveted world championship at some point in their careers.If there are players more devoted to the game or more obsessed with practice and perfection than Taiwan’s Pin Yi Ko and America’s Shane Van Boening, they’ve yet to be discovered. The 26-year-old Ko, a wunderkind since winning back-to-back WPA World Junior 9-Ball Championships, has finally met the pool world’s lofty expectations with wins at the CSI 10-Ball Championship and, more recently, the WPA World 10-Ball Championship in late February. Van Boening, arguably America’s best player since three-time world champion Earl Strickland, has dominated U.S.-based tournaments for nearly a decade, and has shed his reputation for underachieving on foreign soil with back-to-back World Pool Masters titles. All of which made the pair’s epic battle in Doha, Qatar such a delicious treat for the thousands of pool fans from around the globe who hung on every shot while viewing the match on a live stream from the mostly empty Al-Arabi Sport Club. And when Ko pounced on an errant Van Boening safety attempt to secure the title, 13-11, in a nail-biting finale, the overwhelming sentiment was that the finalists had not seen the last of one another on pool’s biggest stage.The win made Ko, who battled through several close calls but never wavered in his resolve, the first player to claim two WPA world titles in the same year. For Van Boening, who had authored several otherworldly performances en route to the title match in hopes of becoming the first American player to win the World 9-Ball Championship since Strickland’s 2002 triumph, the loss was bitterly disappointing, although it further dismissed any notion that he can’t stand up to top-flight international competition.The long road to the World 9-Ball final began with a play-in stage for 13 open spots, a stage of uninvited hopefuls that included former World 9-Ball champions Akagariyama and Fong Pang Chao (both of whom advanced). That was followed by the double-elimination group stage, which produced four players from each of 16 eight-player groups who advanced to the 64-player single-elimination rounds. Despite spreading the top-ranked players through the groups, upsets traditionally abound in the opening stages of the tournament and 2015 proved to be no different. No fewer than five former world champions booked early flights home during the topsy-turvy group stage, the most stunning of which was defending World 9-Ball champion Feijen. After winning his opening match, the normally consistent Dutchman suffered through back-to-back 9-8 losses, first to Alexander Kazakis of Greece, then to unheralded South Korean, Ryu Seang Woo. The 30-year-old Woo overcame deficits of 5-1 and 8-5 to stun Feijen and advance to the knockout stages. Feijen had company on his return trip to Holland, as his World Cup of Pool teammate and Euro Tour Player of the Year Nick van den Berg also failed to survive Stage Two. A pair of Brit former champions also got to share in one another’s misery on flights back to the United Kingdom, as Karl Boyes (2010 World 8-Ball) and Daryl Peach (2007) failed to advance. Boyes dropped successive matches to Lo Ho, 9-5, and the resurgent Chao, 9-7, while Peach’s elimination at the hands of Mishel Turkey, 9-4, gave the host country its first-ever player in the final 64. To complete an unusual trend, two former champions from Germany also departed Qatar on what is now deemed “Judgment Day.” Oliver Ortmann (1995) and two-time winner Thorsten Hohmann (2003 and 2013). Not surprisingly, the always-lethal contingent of players from the Philippines led the finals bracket with nine players while Taiwan (7) and China (6) were close behind. What was a surprise, however, was Van Boening being joined by two other Americans (Mike Dechaine and Hunter Lombardo) in the single-elimination stage. Young Canadian challengers John Morra and Jason Klatt joined the fray as well. One by one, however, the mighty Filipinos were sent packing, with eventual champion Ko, who opened with an easy 11-7 win over Australia’s Justin Campbell, dispatching Carlo Biado (11-4) and Warren Kiamco (11-9). In fact, the only Filipino player to reach the quarterfinals was the nation’s top player, Dennis Orcollo. Ko advanced to the semifinals with an 11-6 win over Morra, who had displayed plenty of nerve with back-to-back come-from-behind wins over England’s Mark Gray (11-10) and former champion Mika Immonen (11-8). Morra won the final seven games in his win over Immonen. Tracking Ko to the semis was Jia Qing Wu of China. A decade ago, Wu, then called Chia Chung Wu and hailing from Taiwan, shocked the pool world by winning the World 9-Ball Championship at the tender young age of 16. The baby-faced lefty appeared to have regained that form in Qatar, rolling past world No. 1 Ouschan of Austria, 11-6, countryman Wang Can, 11-9, and surprising Aloisius Yapp of Singapore, 11-7. America’s hopes rested on the other side of the 64-player bracket, where Van Boening was starting to find a groove. 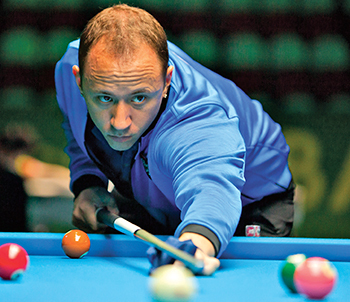 Painstaking preparation has long been the South Dakota native’s calling card, and Van Boening spent hours on the practice tables in Qatar fine-tuning his break shot. The results were staggering, as Van Boening blasted through four consecutive opponents (Poland’s Tomasz Kaplan, Spain’s Francisco Diaz-Pizzaro, Taiwan’s Yu Chang and Orcollo) by a combined score of 44-14. Particularly impressive was Van Boening’s beatdown of Orcollo. The Filipino (losing finalist to Van Boening in the last two U.S. Open 9-Ball Championships) came into the match on a roll of his own, having demolished Turkey, 11-1, Lombardo, 11-7, and 2012 champion Appleton, 11-2. But Van Boening ran from the break on virtually every opportunity in the alternate-break format and pounced on every Orcollo mistake to seize a 10-0 lead before winning, 11-1. Dechaine, arguably America’s second-best player, performed admirably in his first foray overseas. The East Coaster showed plenty of nerve in winning back-to-back 11-10 matches against Taiwan’s Chang Yu and Estonia’s Denis Grabe. In the round of 16, Dechaine battled Pin Chung Ko, the 20-year-old brother of Pin Yi Ko, 9-9. Trailing, 10-9, but en route to forcing a case game, Dechaine jawed the 9 ball. 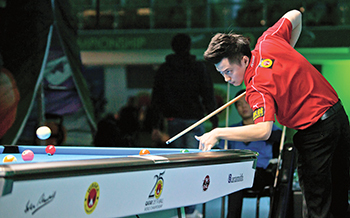 The younger Ko, winner of the 2014 CSI 8-Ball Championship, advanced to the semifinals with a convincing 11-5 win over Poland’s Wojceich Szweczyk. The semifinals offered a number of juicy storylines, with the possibility of the Ko brothers meeting for the title at the top of the list. Having split the 2014 CSI titles, with Pin Yi topping Pin Chung for the 10-ball title and Pin Chung topping Van Boening for the 8-ball crown, the brothers threaten to dominate pool for years to come. Some observers go so far as to contend that the younger Ko is the better player and simply needs more seasoning. Regardless, the duo figures to be dynamic in international events. Of course, the storyline in the U.S. was the chance for Van Boening to reclaim the title that was won by American players six times between 1990 and 2003. And in the semifinal between Van Boening and Pin Chung Ko, that potential result looked increasingly possible. Continuing his incredible success on the break, Van Boening streaked to a 5-0 lead before Ko scratched out a game. 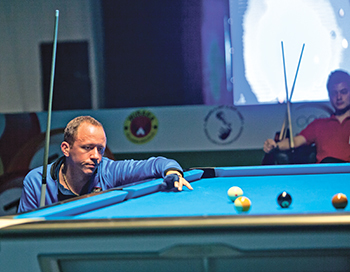 Undaunted, Van Boening simply raced through the next six racks for a startling 11-1 win and a place in the final. Meanwhile, the elder Ko and Wu were engaged in a tense battle of wills. Wu bolted to an early 6-2 lead, but Ko chipped away and forged a tie at 7-7 when Wu botched an easy safety. The miscue turned the tide in Ko’s favor, and the Taiwanese star edged ahead, regaining the break advantage he had earned by winning the lag. The match was tied at 8-8, 9-9 and 10-10, but Wu could only watch helplessly in the case game, as Ko broke and ran out for the win. The title match was close throughout, due in large part to some good fortune in Ko’s favor. At 4-4, Ko scratched and missed in the same rack, only to leave Van Boening stymied both times. Ko eventually won that rack, then, at 5-5, and botched a 2-9 combination, only to see the 9 carom across the table and into the side pocket for a 6-5 lead. Van Boening maintained pressure, eventually forging an 8-6 lead that easily could have been 10-4. Ko fought back to tie the match, 8-8, but another scratch handed Van Boening a 9-8 lead in the extended race to 13. Van Boening appeared to be headed to another two-game advantage when a positional error left him hooked on the 7 ball. His jump attempt railed and Ko again tied the match, regaining his serve. The combatants battled nerves and tough run-outs to 10-10 and 11-11. Ko broke and ran out to reach the hill, 12-11. “He got a lot of fortunate rolls and got lucky to hook me a couple of times after misses,” said Van Boening. “But I also made mistakes that I should never have made. He played great. I think I made more mistakes than he did and that is what cost me. My break wasn’t working, but that’s the way the game plays.